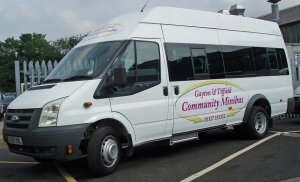 It was because of the poor public transport both for our village and the neighbouring village of Gayton that in 1984 a group of enterprising residents founded the Gayton and Tiffield Community Minibus. It is run as a charity by a group of Trustees under the chairmanship of Rae Spencer. There is a team of volunteer drivers who operate the service, and shopping trips run on a regular basis from the two villages to Northampton and Towcester. Special excursions are also organised from, time to time, such as pre-Christmas shopping trips to Oxford and Milton Keynes.. In addition to the scheduled service (see link to time table below) the minibus is also available for hire by residents and organisations from Tiffield and Gayton. Further details are available from Rae Spencer on 01327 353352.